What Organic Pest Control Options Do I have? Posted 12:46 pm by Chris & filed under Organic Gardening. I recently got asked this question: “what organic pest control options do I have for aphids? Aphids are a herd of food providers for the ants. Some ants go out of their way to ensure the health and wellbeing of the aphids. Similar to a herd of dairy cattle for the ants. The aphids eat the plants and provide “Milk”, actually a sugary honedew they excrete, and the ants eat it. Sounds a bit strange, but not much different in overview than humans and other animals. The ants will sometimes even bring the precious aphid eggs into their nest for the winter to keep them healthy, then in the spring when they hatch bring them out to their “fields” (plants) to feed and produce their bounty. How does this affect your plants, and in Aquaponics (the mutual growth of fish and produce) your fish also. 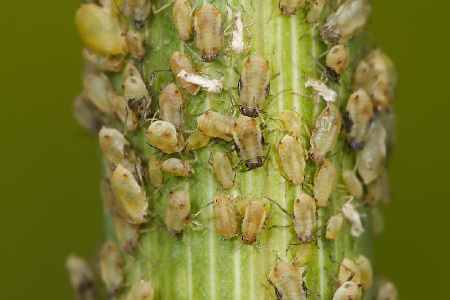 If aphids get on your crops, it can be devastating. The aphids eat and excrete their sugars. This depleats the nutrients of the plants and devastates them. If you are growing Naturally or Organically, what are your options? Chemical sprays: Not a good option if you are going to eat your crops, or if you want to be considered “Organic” or Naturally Grown. The chemicals are not really the way to go. But if you grow Aquaponically, what do organic pest control sprays do to your fish? Soaps kill soft bodied insects by suffocating them, however, they can also kill fish if they damage their gills. Natural Plant concoctions, using chopped, shredded and steeped Tomatoe leaves has been brought to my attention by JR Comito. He shared that it is the alkaloids that kill the aphids, but is not sure of how it affects the fish. For soil gardens, or hydroponics, those restrictions would not be a factor. However, I always err on the side of caution. If it can kill the fish of an Aquaponic system, how will it affect me and my family. Even more important, how will it affect my customers health? As Gardeners and Farmers, whether we grow in the soil, raised beds, hydroponically or Aquaponically, Healthy food and a healthy lifestyle is what I have found most people want. There are some growers that only care about the bottom line profit but they are not as prevalent as they use to be. Especially now since our customers are becoming more aware of the dangers of chemicals. The Lady Bug!! Yahoo, for me, they do the work and they are cute. I do not have to do any work, the bugs eat well, and the aphids are layed waste by the lady bug! You do not have lady bugs? What to do? Create a solution of a good quality organic dish soap and mix a solution of 1 tablespoon of soap to 1 quart of rain water or filtered water. Spray it on the plants and around the plants to wash away the chemical trails that the ants leave while driving their herds of vampiritic aphids to your plants. Keeps them guessing. You can also mix some cayenne pepper into the mix, and it will also help keep the ants and aphids at bay. Make an organic soap from the Agava Plant. I have not tested it on fish yet, but it works in the garden. All in all, there are a lot of options to control aphids organically on your plants. You can also work on confusing the ants to keep them away by “erasing” their trail to your garden or crops. Join our newsletter feed to discover more great information. We area always searching new and old ways that work organically to produce more great food and share our findings with you!